Everyone knows that house in the neighborhood: the one that goes ALL OUT for every holiday. They’re the ones who put up millions of lights a month before Christmas, the ones that put Santa and his sled on their roof and keep it there until February, the ones that put fall festivity decorations up as soon as September 1st hits. If you’re one of those houses, we congratulate you! More power to you! And since you’re our type, and we’re clearly yours, we invite you to check out our myriad of Halloween decorations. Looking to go all out? 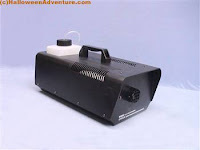 Snag our Airblown Haunted House with Light Show. You’ll be the talk of the town! 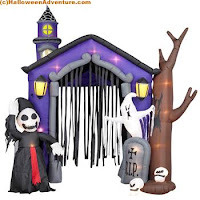 Airblown Haunted House with Light Show and Reaper has a house shaped purple and black frame with a Reaper on one side and a brown tree, ghost, gray tombstone and 2 skulls on the other. Measures approximately 10' high when inflated. Plays scary Halloween music and sounds including the Halloween theme. Lights flash in time to music. House lights up for a eerie glowing light show. Light up the front porch with our eerie Blinking Skeleton Lights with Sound. These Skeleton Lights with Sound (10 Lights) has skulls that light up and blink in time to the spooky music. Plays "Halloween" theme. Motion activated. Skulls light up green, orange and red. They’re the perfect way to decorate without going overboard. Arranging a Haunted House? Make it realistic. Tape the walls out with our Black Out Room Room Roll. This background sticks onto the wall for the time being, but is easily removable. Looks great with our Fog Machine. Spoooooky! Scare them off (or just give them a little fright!) with our Dangling Spider Light Set. Dangling Spider Light Set is approximately 11' long (6' lighted length). Has an end-to-end plug to attach other light strands (sold separately). Includes 2 spare bulbs and 1 extra fuse. Contains 9 Light Up Spiders (3 orange, 3 green and 3 purple) that dangle on black wires that have little purple lights at different intervals. 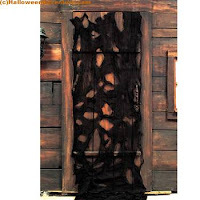 Make the front door special this Halloween with our Black Creepy Cloth. Cloth measures approximately 30" wide x 12' long, is made of a black gauze material and is flame retardant. Includes enough material to cover 2 doorways! This works perfectly on the front door, or on the door to a Haunted House. Gauze materials adds extra dimension of scare, as it almost resembles an oversized spiderweb. 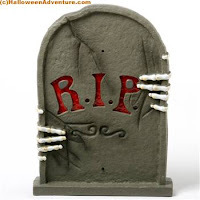 Snag some of our Skeleton Hands Tombstones and decorate the front yard for Trick or Treaters. Instead of raising the roof, you’ll be raising the dead. The "RIP" lights up in red; tombstone makes scary thunder and screaming sounds. These are only a few of our decorations, so check out the website for more ideas! Remember, it’s always more fun to have too much than have too little!